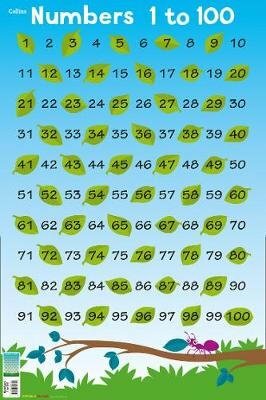 Colourful Illustrated Poster of Numbers 1-100 This highly illustrated poster is designed to help children learn the numbers 1-100. Ideal for encouraging young learners, this colourful and highly informative poster is clearly laid out to aid counting skills. This attractive rolled poster suits home or school use, and can be used for independent learning or school projects. Dimensions 610 X 915 mm Illustrated by Steve Evans.